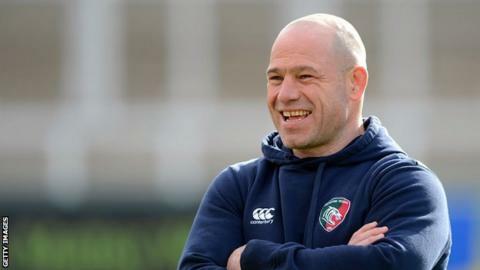 Leicester Tigers director of rugby Richard Cockerill has said the club's youngsters must "step up" at the start of the season. Tigers could have as many as nine players away at the World Cup, including six from the front row. Cockerill told BBC Radio Leicester: "We've got six front-rowers missing for the World Cup and they're all of world-class quality. "But people have to step up and we have some strength in depth there." He added: "Greg Bateman has trained really well, Fraser Balmain made huge strides last year and Riccardo Brugnara and Tiziano Pasquali are good players. "Aniseko Sio, who is an international player with Samoa as well, and there's a couple of young guys under that with Dan Hogan and Owen Hills." England forwards Tom Youngs and Dan Cole, Samoa's Logovi'i Mulipola, Argentina's Marcos Ayerza and Italy's Leonardo Ghiraldini and Michele Rizzo could all be included in their countries' World Cup squads.